Photo from High Bridge Arms Facebook page. San Francisco, California has over 850,000 residents*. But thanks to SF’s gun-phobic elected officials, you soon won’t be able to find a single store that sells guns and ammo within city limits. High Bridge Arms, San Francisco’s last remaining gun shop, announced it will be closing its doors in October. The reason is the threat of a new SF law requiring gun retailers to video-tape sales transactions and turn over private customer data to the city. This proposed city ordinance goes way beyond existing state and Federal background check requirements. Given the threat of this draconian new city law, High Bridge Arms, San Francisco’s last remaining gun store, announced it would cease operations next month. Posting on Facebook, High Bridge’s owner declared: “We are closing our shop. For many reasons I cannot get into at this moment, it appears our final days will be through to the end of October of 2015.” It is not known whether High Bridge Arms will re-locate to a different location outside San Francisco city limits. High Bridge Arms has a long history in San Francisco. Serving sport shooters as well as city law enforcement personnel, High Bridge has operated in the same Mission Street location since the mid-1950s when Olympic shooter and gunsmith Bob Chow opened the shop. In 1988, Andy Takahashi bought the business from Mr. Chow. 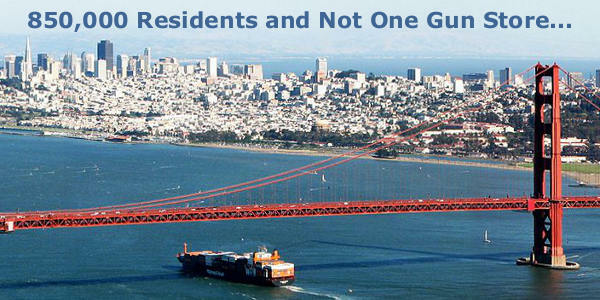 *The U.S. Census Bureau estimates San Francisco’s population at 852,469 as of July 1, 2014. San Francisco photo by Creative Commons License, attribution Bernard Gagnon. 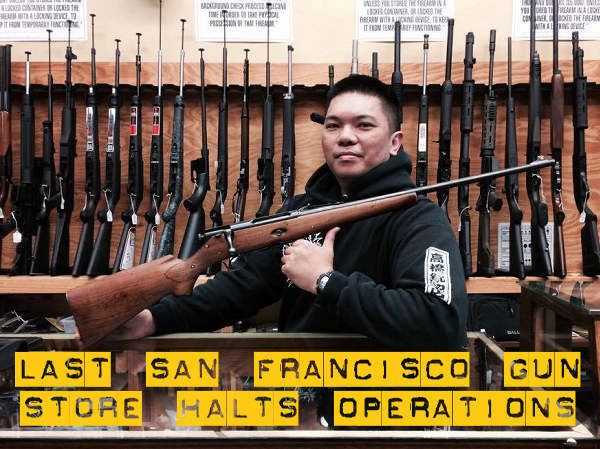 Share the post "San Francisco’s Last Gun Store Closes — Thanks to the Politicians"
What is most disturbing about this news is that the citizens of SF are allowing the local government to do it. That tells me that the citizens of SF support such laws and don’t care about liberty. Does this mean that have also rid the city of all bad guys with guns as well? Don’t totally blame the politicians. Who put them in office????? 850,000 residents? Really? Texas has over 850,000 CHL holders alone! Imagine a Texas CHL rally held in SF with all the CHLs attending. What fun! Not to hard to figure out what political party is in control there. lets see how soon it will be for gun crimes to go to zero. Thanks to the politicians, and the complete lack of support from the National Rifle Association! I wouldn’t blame this one on the NRA. The states full of demacrates that want the guns gone, simple as that. The NRA threw the poor guy under the bus. They dropped their lawsuit against the city and county and ran away with their heads between their tails, leaving the remaining gun shops to take on the politicians by themselves. in CA politics in general if your pro gun, pro life or pro traditional values (and there are plenty of people who are) you have no real representation in government, the place is run by the city people. The people of San Francisco have decided to walk around naked as long as they sit on a napkin, maintain the right to be a sanctuary city and snub their noses at the US Immigration laws and now put these rediculous rules in place regarding gun sales. The home to Nancy Pelosi, Feinstein, Gavin and others who live in rarified air. People that are simply 180 degrees out from the rest of the country. We need a national permit to carry that supersedes these crazy local laws asap. Me Preside t ECT, let’s get R done in the first 100 days. I hope the Feds start locking up officials who openly defy immigration laws and make an example out of them.